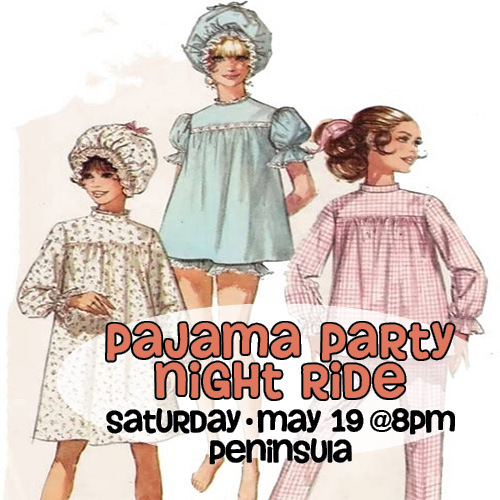 Century Cycles is once again putting the old-fashioned slumber party on two wheels for its 3rd Annual Pajama Party Night Ride on the Towpath Trail on Saturday, May 19, at 7 p.m. at the Century Cycles store in Peninsula (1621 Main Street/Route 303). The nighttime bicycle ride in bedtime clothes is in celebration of Cleveland Bike Month in May, and it will benefit Project Night Night. It is free, open to the public, and suitable for all levels of bicyclists. For more information, visit www.centurycycles.com/for/NightRides or call 330-657-2209. 7 p.m.: The festivities start in the parking lot of Century Cycles’ Peninsula store with cycle-your-own-smoothies on the blender bicycle, glow-in-the-dark goodies and bike accessory giveaways, a few rounds of "Spin the Water Bottle for Cycling Truth or Dare,” and the mutual admiration of everyone's excellent sartorial taste in pajamas. 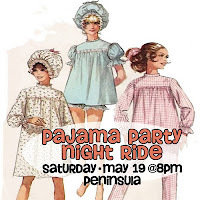 The Pajama Party Night Ride is free and no pre-registration is necessary. However, riders are asked to bring a new children's book, stuffed animal or small flannel blanket for Project Night Night, a children's charity that provides nighttime comfort packages to homeless children. Grunt Girl Racing, a local training group, will be collecting, sorting and delivering the donations. Pajamas are not required but HIGHLY encouraged. 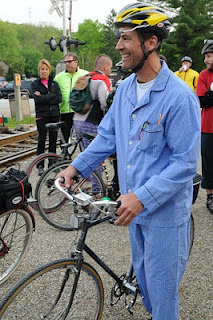 Be sure those pajamas don’t hang, drag or get caught in a bicycle’s spokes or chain. Also required: A bicycle to carry you, a bike helmet to protect your noggin, a bike headlight to light your way (the Towpath is completely unlit and very dark at night), and – if under 16 years of age – an accompanying adult. Riders should park in the Lock 29 Trailhead lot, just north of the store, and will have to sign a waiver prior to riding.